Groups and resources of interest to the Native American people. 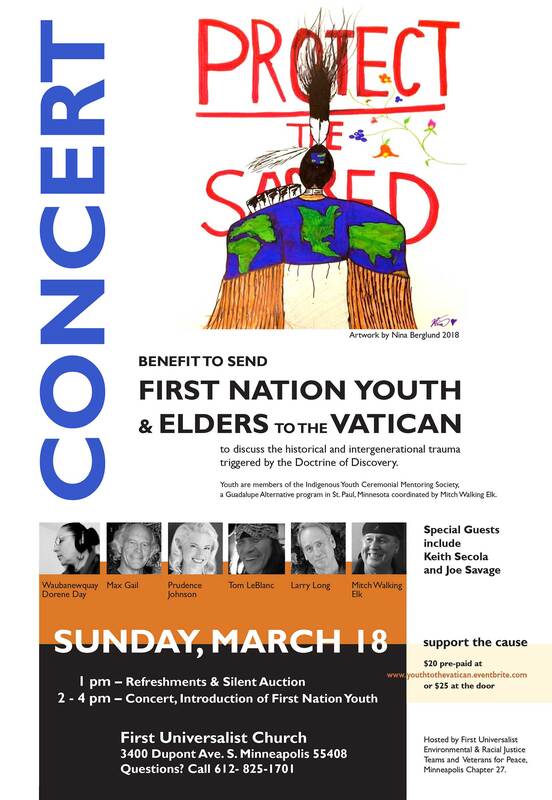 Benefit to send First Nation Youth & Elders to the Vatican to discuss Doctrine of Discovery. triggered by the Doctrine of Discovery. a Guadalupe Alternative program in St. Paul, Minnesota coordinated by Mitch Walking Elk. include Keith Secola and Joe Savage. With Waubanewquay Dorene Day, Max Gail, Prudence Johnson, Tom LeBlanc, Larry Long, Mitch Walking Elk. Hosted by First Universalist Environmental & Racial Justice Teams and Veterans for Peace, Minneapolis Chapter 27. Known to Dakota people as Oȟéyawahe, “the hill much visited,”, Pilot Knob is a place of distinctive historical, cultural, and environmental importance, a sacred site, a landmark of Minnesota’s beginnings. The Pilot Knob Preservation Association, advocates for this distinctive hill, documents its long history, raises public awareness of its importance, and helps to preserve it for present and future generations. Dakota 38+2 Wokiksuye Memorial Ride and Annual Mankato Run 2010. Crow Creek reservation land being auctioned off.